What are the main ingredients of Laminine? While FAEE forms the most protein component of Laminine, other protein extracts come from fish, sea (vegetable) plants, & yellow pea. Fish extracts are from shark cartilage. Cartilage is flexible, tough elastic tissues. The vegetable proteins in Laminine are extracts from sea plants and yellow pea. How is it different from other egg extracts? Since early 2012, LifePharm Global Network or LPGN has sourced its Fertilized Avian Egg Extract from organic, cage-free, hormone-free chicken farms in the United States, which is then developed with the process of Hygienic Evaporative Cooling. Hygienic Evaporative Cooling keeps the peptide chains that are so important in Laminine intact when converting the Fertilized Avian Egg Extract from a liquid to a powdered form. This technology is exclusive to LifePharm Global Network and was not readily available anywhere else in the world besides the United States. What is Young Tissue Extract or YTE? Young Tissue Extract contains a natural combination of potent amino acids and glycopeptides, which are enriched in the period immediately after fertilization. It is important to understand hen’s eggs that have not been fertilized by the rooster’s sperm cannot produce a chick, but fertilized eggs, the source of my Young Tissue Extract, contain a viable embryo. If incubated by a hen sitting on the egg or in an incubator, it will form the chicks within 21 days or three weeks. In this three-week period, from the day the rooster has fertilized the hen until the fully developed chick is ready to be hatched, a tremendous amount of cellular growth and development takes place in the embryo, which ultimately develops into the grown chick. What we have done is to develop a process to extract that tremendously powerful growth material and put it into a capsule form, which is called Young Tissue Extract. Previously, LPGN sourced its Fertilized Avian Egg Extract as Young Tissue Extract or YTE from Norway, but the change occurred to ensure the quality, traceability, and supply of our materials. The laws governing avian products are especially stringent in the U.S.A., and LifePharm Global Network prides itself on operating under FDA and cGMP guidelines. Are eggs from Norway better than eggs in the USA? Laminine no longer uses YTE from Norway since 2011. Dr. Eskeland himself went to the USA to produce a better way to extract the eggs (YTE), and the USA-version was labeled Fertilized Avian Egg Extract (FAEE). Dr. Eskeland was a Norwegian who invented YTE finds “no difference in using eggs from Norway or USA.” Laminine works better because of the combination of ingredients. How is OPT9™ (FAEE) superior from YTE? 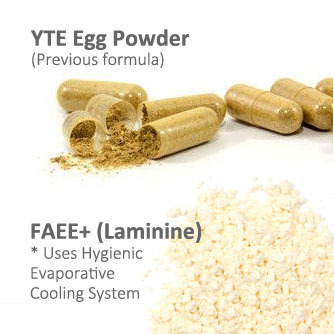 Laminine uses the base ingredient FAEE which has a lot of similarities with YTE. They both come from hen eggs which are partially incubated and extracted on the 9th day of incubation. The difference is how the process of extraction takes place. 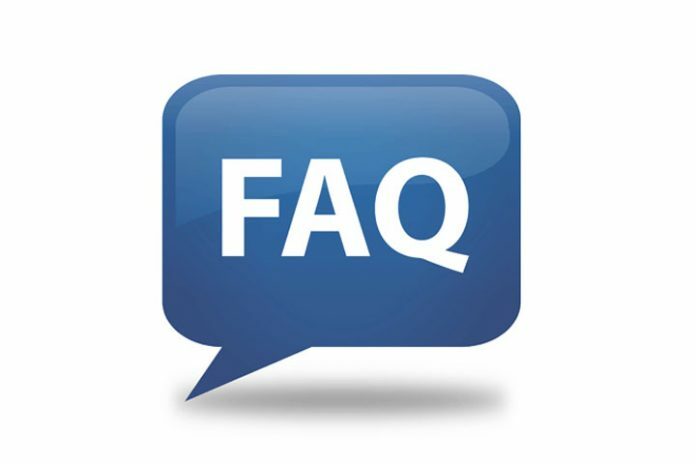 LifePharm uses a patented extraction process called “Hygienic Evaporative Cooling (HEC) process.” With an HEC process, there is no temperature rise that will cause denaturing (alter the natural qualities) of the peptides (proteins), thus preserving all nutritional elements of the product. The comparison between Laminine and other products is like comparing Apples to Oranges. Every step of our manufacturing process adds to the efficiency of the final ingredient, and that cannot be copied by anybody else. Just like a good cappuccino, it’s not a number of coffee beans that makes the taste, it’s the blend of coffee beans AND other ingredients, at the right temperature and right timing, that affects the result. We can use the same analogy with Laminine OPT9™ proprietary blend versus others generic and proprietary brands in the marketplace. It’s this synergistic effect that makes Laminine different from anything out there. Dr. Eskeland, the founder of the fertilized avian egg extract, helped LPGN to develop this newly improved, second generation process exclusively for LifePharm Global. * Denature proteins are low-quality peptides (proteins or nucleic acids lose the quaternary structure) that result in poor extraction or when a high temperature is applied. We use a state of the art drying technology that’s not readily available anywhere else. If there are ever any complaints about a bad batch of the product Laminine, The LGPN team can fly directly over to our local farms here in the USA and inspect the manufacturing process from when the eggs are picked up to when they become a capsule. LPGN product tracking allows us to follow the path of specific components in our OPT9™ blend. Visibility across the supply chain i.e. the ability to trace each ingredient from “farm to capsule” through the creation of batch genealogy is vital to ensuring the quality of our products. In this way, we’re all protected. LifePharm is the only company in the world that has been licensed to utilize this technology in our production process, and this continues to differentiate LPGN’s products from others YTE or generic egg extract brands. This process is slower and more costly which explains why FAEE is more expensive than YTE. This process is the best way to maintain the peptide chains that are so essential in the fertilized avian egg extract. The United States government has become more and more stringent about this. Just look at this requirement passed recently by the FDA. LifePharm is the only company in the world that has been licensed to utilize this technology . 4. Why is OPT9™ blend more superior than other egg extract products? The OPT9™ blend has superior quality compared to other extracts. First of all, it is patented, and no one by international law is allowed to formulate the same ingredient blend. Also, Dr. Bjodne Eskeland who formulated the base ingredient called YTE or Young Tissue Extract worked with LPGN scientists to produce the best quality egg extract in its most potent form. Dr. Bjodne Eskeland, the founder of the Fertilized Avian Egg Extract (also referred to as YTE in the earlier formulation), was exclusively part of our Lifepharm Scientific Advisory Board. Before his recent and regrettable passing in June of 2015, Dr. Eskeland publicly acknowledged and confirmed that the Laminine formula (OPT-9 blend) was producing unprecedented health benefits compared to his previous formula. Dr. Eskeland confirmed Laminine formula (OPT-9 blend) as better compared to his previous formula. Dr. Eskeland was the scientist who developed YTE or Young Tissue Egg extract. He worked with LifePharm to produce the best version of this extract.